A recent post on a Facebook page was preceded by the comment: “This is what I am talking about! A must watch” [sic]. The person who posted it could however not have known it was what he was talking about, because it was one of those Huffington Post links [don’t bother to follow this link, unless you want to verify there is nothing but a link there] to an Upworthy republication of a video [please do follow this link] published by Represent.us, an organization dedicated to ferreting out political corruption. Now, the person who posted it could not have known that the video exposed Jim Himes (D – CT 4th District) as being a tool of the financial industry—something to which every Democrat likely objects. So let’s count the ways this was wrong. First, let’s make clear the fact that the majority of voters, especially Democrats, almost universally demand stricter regulation of the financial industry. Thus lobbying for and voting for a bill virtually written by CitiBank that would loosen regulation on derivative trading is wrong. Next, let’s make clear that exposing a corrupt “corporate” Democrat was not wrong, but everything about the post by each publisher was wrong for not making it clear that there were 69 other Democrats who joined the one upon whom they should also have focused their spotlight. 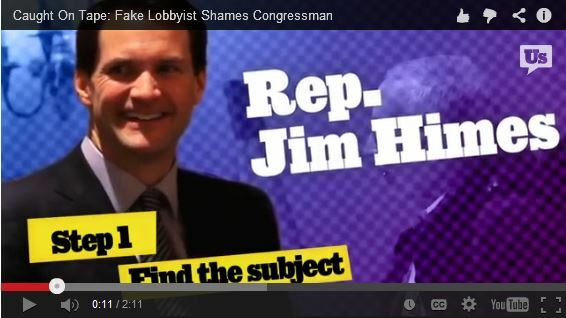 In response to our action, Himes’ spokesperson argued that H.R. 992 had bi-partisan support. Our response? That’s exactly the problem! If both major parties support a law that was written and paid for by the very same banks that law is supposed to regulate — who is left to represent the people? This is not about partisan politics. It’s about creating an American government that represents us. Nearly 99 percent of the Republicans who cast a vote voted for the bill. By comparison, only just over one-third of the Democrats voted for it—and 119 others voted against it. Clearly, the message should have been that there are 70 Democrats in office today who should be challenged in the primaries, and taken out of the running. That’s not the message that is getting out though. The message all those have published will either be understood as one—or all—Democrats are as guilty of being in the pocket of big business, depending on a person’s level of cynicism. It’s as though none of the publishers realizes that feeding the cynicism of liberals is as damaging to any effort to correct the problem as voting Republican. Every liberal who decides to vote third party—or not vote at all in protest—casts a vote for the Republican candidate. Check the list of the guilty to see whether one of them betrayed their trust to you and your fellow Democrats, and help us clean House. Write a letter to the editor of your local paper excoriating the apostate. Find and join or donate to the campaign of any challenger. Make this a campaign issue in the primaries.